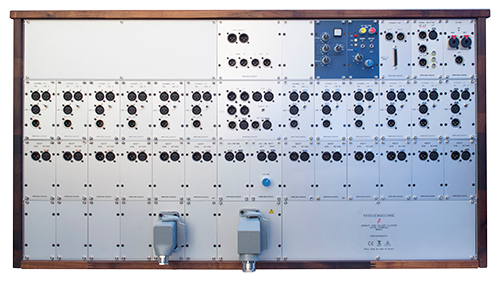 The Krässemaschine is a 12 channel modular valve tube mixing desk. There’s no transistor in the signal path except for the op amp based monitor section. Mic input with switchable 48V, polarity, pad. Two aux send master and aux return, each aux return with pan pot. two VU meter for the L/R bus, switchable to measure the aux sends. 0 VU reference point switchable from 4 dBu to 10 dBu reference. All channel and master inputs and outputs on the back. 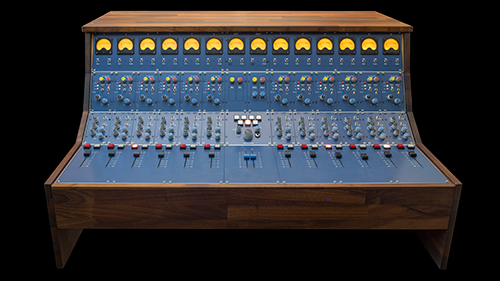 The Mix output has a switchable insert path. DI-Box, 8 channel passive summing device and a Lundahl 1581XL-based signal splitter.Two spare modules (amp, EQ) are available. The PSU is built into a separate 19“ enclosure. The Krässemaschine is offered as complete service. Transport, installation, briefing etc. will be done on the first day of the rental period. The client offers installation support and supplies all required cables if not rented separately. The minimum rental period is 7 days and can be extended for additional 7 days periods. Day one: delivery, set up, functional test, briefing, wiring support and signal flow tests. Day two to day six: enjoy, telephone support offered. Day seven: functional test, dismounting, transport. Client cooperation is expected for installation, wiring etc. You’ll find additional options and terms of conditions in the download section. ATTENTION: all documents are in German. 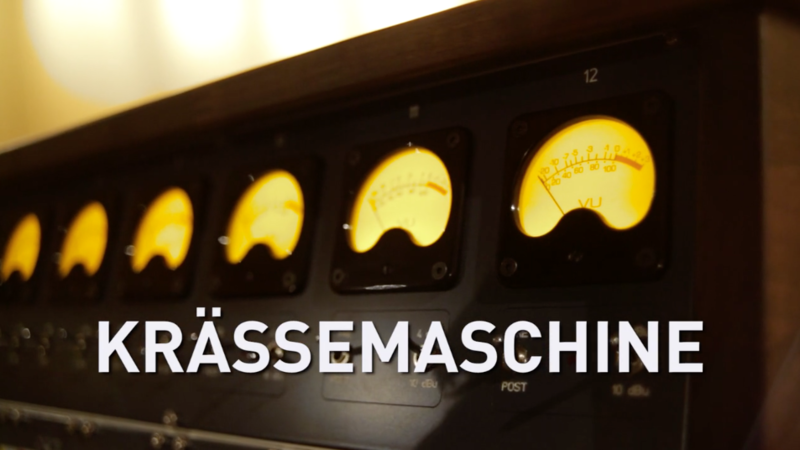 The Krässemaschine is based on an amp card developed by Ian Thompson-Bell, first introduced in GroupDIY forum. 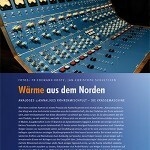 This amp card, the „EZ Mixer“ card, as well as another design by Ian Thompson-Bell, the passive EQ card, is the core of the Krässemaschine. The amplifiers in a modern mixer need to be able to drive high levels into several buses at low distortion, provide a wide range of gain and introduce minimal noise. This is easy to do with modern op amps but it is not so easy with tubes. The output drive capability of the EZMixer card is provided by an SRPP stage using a 6922 tube. The SRPP is a true push pull circuit so, at given idle current, it can output four times the power of a simple single ended stage. The SRPP uses two triodes, one of which has its cathode at about half the supply voltage. In order to avoid exceeding the tube’s maximum heater cathode voltage, the heater supply has to be elevated to about one quarter of the the supply voltage. Unfortunately, in achieving its improved drive capability, the SRPP produces much higher levels of distortion. At 20V rms into a2400 ohm load, the 6922 SRPP produces over 2% harmonic distortion. The only way to reduce this to an acceptable level is to use negative feedback ( NFB) and in the EZMixer card, about 20dB of NFB is used to bring the overall distortion to about 0.2%. The SRPP stage is preceded by a 12AX7 stage to which the NFB is applied. The NFB can also be used to vary the overall gain. Although this is easy in op amps, it can easily cause stability problems in tube amps. The stability problems and variable gain can be solved by a single technique; a technique that was used many years ago in the Telefunken V76 amplifier. The key is to vary the open loop gain at the same time as the closed loop gain is varied which maintains a constant amount of NFB and thus ensures stability. In the V76 this was achieved using a stepped potentiometer. In the EZMixer card it is achieved using a single resistor whose value sets both the open and closed loop gains. The EZMixer card also closes the NFB loop at dc so it is always unconditionally stable at low frequencies. We would like to thank Ian cordially for his technical support. This would have never happen without him. We’ve compiled some pictures as well as a video from the period of prototyping to the first public presentation. Enjoy! „The name-giving was inspired by Jan Zehrfeld from Panzerballett. Jan told during a concert announcement, that he and his colleaguas were thinking, how one could make music „krasser“ (means something like stark or rad). The Studio Magazin published a detailied test oft he Krässemaschine in their edition 03/2015. The testing took place on march, 12-13th 2015, at Tonstudio Keusgen, Haldern/Rees and was conducted by Fritz Fey and Friedemann Kootz. 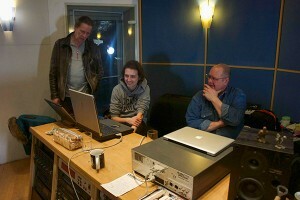 The tube technology was able to convince the skilled and experienced testers and also the studio owner Klaus-Dieter Keusgen and his audio engineer Matthias Höfkens during several live recordings. 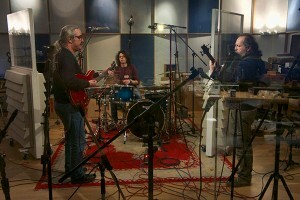 Thanks to Wolfgang Güdden (sax, bass) Frank Schut (git, vocals) and Matthias Höfkens (drums) for their live performance! „It is a unique item with a spectacular sound signature, which make the heart of every audio engineer leap. Please give me more information about Krässemaschine.